This is one of the Syrian dishes that our family grew up with, courtesy Mom and her father. We generally make it for certain occasions, such as ‘Id, or when some family member who hasn’t had it in a while returns home. While it may be common food in parts of the Middle East, because of the onetime rarity of bulgur wheat in Trinidad it is more a specialty dish in our house. And perhaps because, when made properly, the baked kibbe can be fairly rich for our tastes – all the olive oil and melted butter! In honour of Ramadan which started last week, I am finally trying to post this recipe, although I don’t have proper internet, and I am about to travel So forgive me for lack of clarity! From WikipediaKibbeh (also kibbee, kubba, Arabic: ??? ), is the national dish of Turkey (as içli köfte in Turkish). It is a common food in Palestine, Lebanon, Syria, Iraq, North Africa, and the Caucasus. In its most common form, it consists of minced lamb mixed with bulgur and spices, stuffed inside a bulgur pastry crust and grilled, boiled or fried. The shape, size and ingredients vary between different types of kibbeh and between the recipes traditional in different areas. The mix of spices changes as does the composition of the crust. Kubbat Halab is an Iraqi variation made with a rice crust, though apparently not originating in the Syrian city of Halab (Aleppo) as some have claimed. Kubbat Mosul is another Assyrian-Iraqi variation originally from Mosul where a bulgur crust is used, but the shape is flat and round, like a discus. Finally, Kubbat Shorwa is the last Assyrian-Iraqi variation where kibbeh is mixed in a stew, usually cooked with tomato sauce and spices. The meat and bulgur mix, without the crust, is often served raw (called Kibbe Nayye), similar to steak tartare. This is a popular delicacy in Syria, Lebanon, and the Palestinian territories, and is often accompanied with arak. In Lebanon, it is common to serve fresh kibbeh meat raw, and then cook the remainder the next day. We usually make the baked in a pan, layering the meat and bulgur. And although a few Arab friends and acquaintances have mentioned knowing about that version, I’ve never seen it until the day Lilandra and I were watching the Travel Channel visit Lebanon. I think there are so many twists to the way this dish can be prepared, from the seasonings to the constructions. This page has a few of those as ideas. I attempted to make sure these recipes were simple, which may in turn have made them seem more complicated. At the very least, it should give some ideas for this dish. There are 3 or 4 ways of making the actual kibbe presented here. Enjoy! 4. Shape the bulgur/meat mixture into balls, flatten a little into elongated ovals, and deep fry. 1. Repeat Steps 1 and 2 above. 3. Mix bulgur with ingredients (d) to (i), take golfball sized portions, make an indentation and place a spoonful of meat mixture in, close bulgur around meat, and shape into elongated ovals. Alternatively, you can cook the meat as in Step 4, mix in about 3/4 of the meat with all the other ingredients, place in greased pan and top with remaning meat mixture and drizzle with butter. Some people may mix in the raw seasoned meat with the bulgur etc and bake. These recipes are from my mother, with some variations to attempt to clarify on my part. Questions are expected. Note (13 October 2009): In all the recipes I have seen for baked kibbe (or any kind of kibbe), they all have the meat mixed into the wheat for the “crust” part. But we never did that – wheat and meat separate layers. 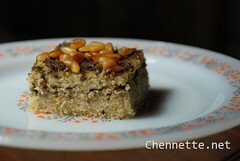 I just saw in Saveur online, a recipe for baked kibbe made like Mom’s, that is said to be “distinctly Syrian Jewish”. Now, Mom’s family isn’t Jewish, but we’re narrowing down the geographical source of our version In case anyone’s interested her family is from Tartous in Syria. This entry was written by Chennette and posted on September 18, 2007 at 2:29 pm and filed under food, Ramadan, recipes, Trinidad and Tobago. Bookmark the permalink. Follow any comments here with the RSS feed for this post. Post a comment or leave a trackback: Trackback URL. the ones i usually eat! Hi nQ and welcome! The picture shows the baked kibbe in a pan, the way my mother usually makes it. And I’ve seen it done that way on a Travel Channel visit to Lebanon, but only then. Usually people make the fried version. I heard about this but never had it. Looks delicious. 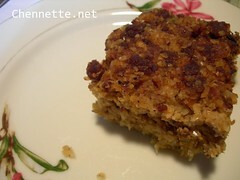 I saw the recipe at Savour.com and link to Your blog. I`m going to try the kibbe recipe tomorrow. I’m very happy to find Your blog -it is very interesting for me to learn about not European culture and food. Hi and welcome Anna! Let me know how the kibbe comes out!